Confession: I’ve never been one for green beans. Then I ventured down this path of whole-food, plant-based vegan eating and really decided to take another run at just about every vegetable. This health pathway is about finding abundance, options, and infinite variations. Plus, green beans are well-loved by the French culture. One of my pleasures is watching French movies, particularly romantic comedies. There’s something so refreshing about French films. They are often more honest, more real, and far less commercialized in comparison to American movies (not that I don’t enjoy those, too). You may have noticed that in American movies, the female leads wear a different designer outfit in every half scene. In contrast, the leads and heroines of French movies dress simply (though beautifully), without obvious nods to brands or trends, and you will see outfits repeated throughout the movie (just as is natural in life). Another reason I love these movies is because they give snippets into French food culture. One movie I’ve recently enjoyed was a romantic (dark) comedy called Lolo (2015). In it, the main lead, Julie Delpy (actress and director and screenwriter!) is having lunch with her love interest. She orders “les haricots verts” at his office’s cafeteria and is given a plate entirely covered in: green beans! Her lunch is a plate of steamed green beans, a salad, an apple, and a yogurt. While the character isn’t, her lunch is just about vegan (sub cashew yogurt and absolutely vegan)! This made me decide to reconsider green beans. Thank, heavens! Otherwise, I would have missed out on this delicious recipe and those to come. This recipe is so, so easy and simple. Fresh green beans steamed on stove top or in the microwave. (If you enjoy using your microwave, rest easy. Steaming veggies in the microwave is fast, economical, and preserves nutrients well.) Sliced cherry plums, toasted almonds, and a fresh lemon-balsamic vinaigrette polish this off into a tasty main or side dish. 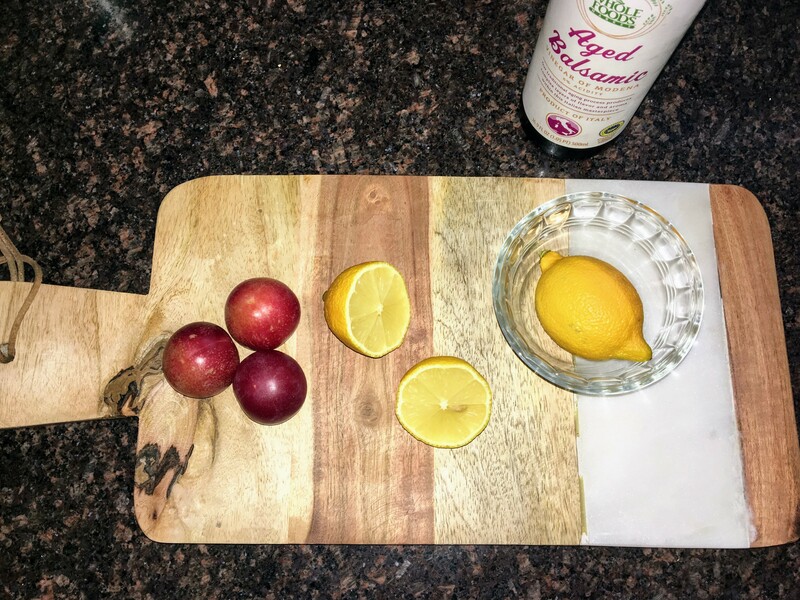 The green beans are tender (or crunchy if you prefer so), the plums are juicy, and the sweetness tangs perfectly with the tart of the lemon juice. Plus, add the depth of the crisped almonds and your belly is in for a well-rounded experience. This recipe was also inspired by Clotilde at the delightful Chocolate and Zucchini. This FFV adaptation is oil-free, low-salt, sweet rather than spicy, and ventures into a different new fruit to me. 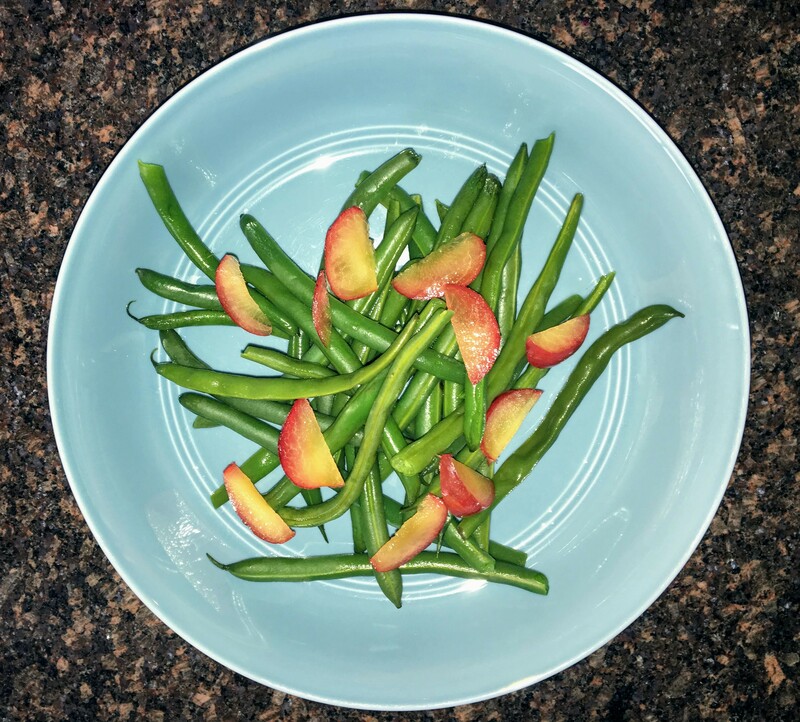 Clotilde also inspired our delicious carrot-beet salad which would accompany these green beans nicely. While you can leave off the almonds, I thought the green beans looked a little naked without them. Substitutions that would absolutely work are other stone fruits, slivers of basil, and other nuts such as walnuts. If not using nuts, consider adding a saltier element like a scattering of olives. Depending on whether you are streamlining your physique or not, feel free to add more of these delicious whole-food plant fats. 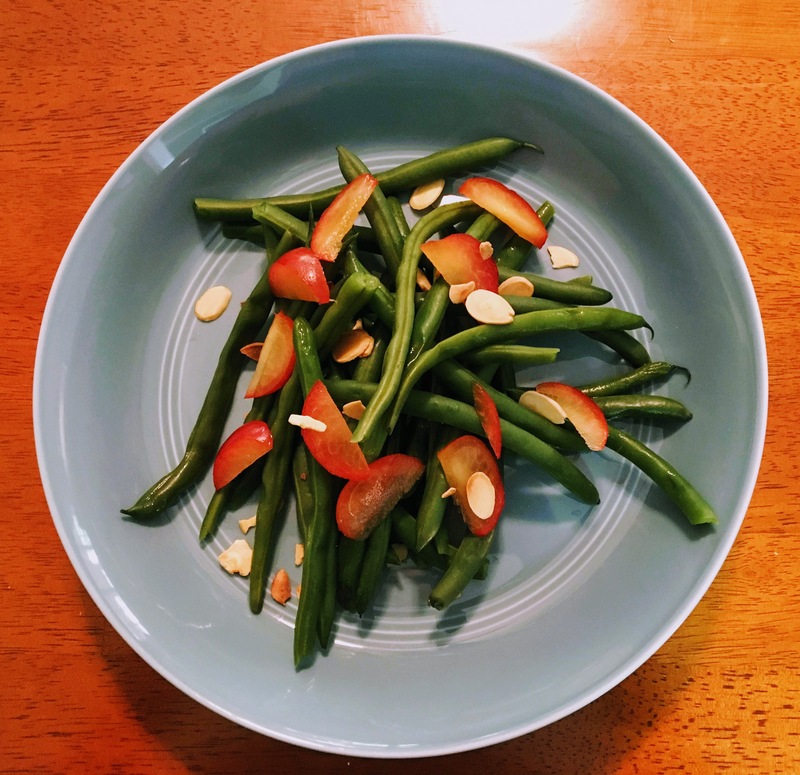 Green Bean, Cherry Plum, & Toasted Almond Salad is a grounding, lightly sweet, and nourishing main or side dish for dinner. This recipe serves 2 as a main course or 4 as side dishes. Steam the green beans to your desired crispness. I prefer tender, so steam them for longer (8-10 minutes). They can also be steamed in a lidded microwave-safe container (I usually use pyrex) for approximately 5 minutes (add 1-2 tbsp of water prior to microwaving). 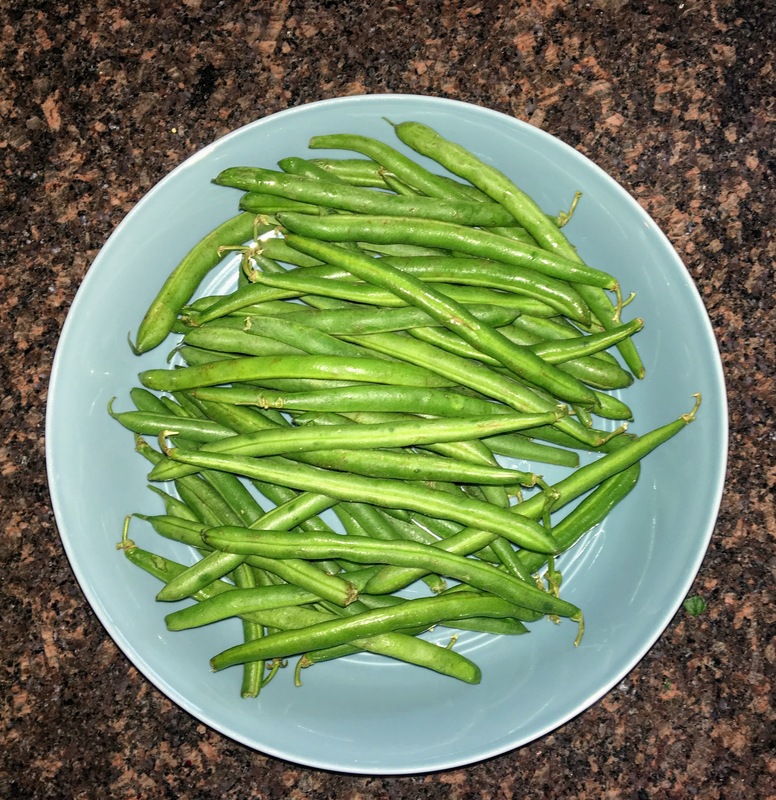 Immediately after steaming, plunge green beans into an ice bath to stop cooking. Once they are cooled, take them out of the water and lay on a towel. Pat dry. Slice the plums into thin wedges or slivers. In a small bowl, squeeze the lemon juice and remove seeds. Whisk the balsamic vinegar in with the lemon juice. Layer the green beans, sliced plums, and toasted almonds. Lightly drizzle dressing on top to preference. Serve at room temperature. Will keep in fridge for 4-5 days. I enjoy this Whole Foods 365 Balsamic Vinegar for its taste and affordability. Always read ingredients when purchasing vinegars as plenty of brands add “caramel color” and other additives. Microwaves and steaming equipment vary in strength, so poke green beans with a fork to check for “doneness” intermittently.